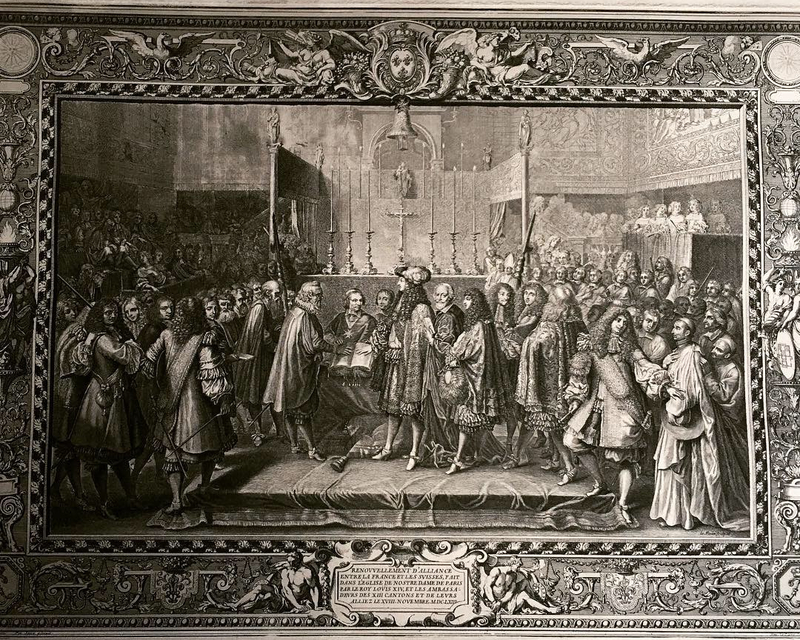 J-B Nolin and J Le Clerc, after C Le Brun, The renewal of the alliance with the Swiss…18 Nov 1663, from the History of the King tapestry series. 1680 (mid 20th century reprint from original plate). After the revelation that my successful Australian Research Council DECRA application was vetoed without explanation by the Australian Education Minister, I bought a copy of one of the prints that was the subject of my ill-fated grant at a Paris flea market. I removed it from its grotty frame and studied the lines, hatches, dots and lozenges. As I did I began to wonder again: What would the Kangxi Emperor of China thought of the meticulous rendering of clothes, the fine concentric and hatched lines that described form, and the curious mise-en-abyme of borders within borders. Would the Shah of Persia even have looked at the copy given to him in the last years of Louis XIV’s reign, when the French sent an envoy to Isfahan in the hope to gain a hold in international trade increasingly dominated by the Dutch and English. And what of the king of Siam, Phra Narai. Did he look at the magnificently dressed king in his petticoat breaches and see his equal? Finding this print today has reminded me of what really drives me to study these extraordinary documents crafted with unfathomable skill, and made to communicate across the world and into the future.